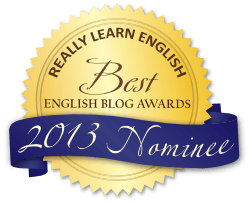 This blog has been nominated for the Best English Blog Award 2013 by the ‘Really Learn English’ team! Wow! I’m so flattered. That’s so cool. I’ve just seen the other blogs and they are all REALLY good. I’m in stunningly good company, so go check them out. Click the badge below and it will take you there. But please make sure you vote for this blog! Ha! But I voted for you anyway! British problems Soccer or football?